Developed by Yacht Club Games. Published by Yacht Club Games. Released June 25, 2014. Available on 3DS (reviewed), PC (reviewed), Wii U.
Shovel Knight oozes charm, with its Genesis-era graphical style, wonderful soundtrack, and silly sense of humor. Shovel Knight is clever, using simple bouncing and digging mechanics and marrying them to fiendish level design. 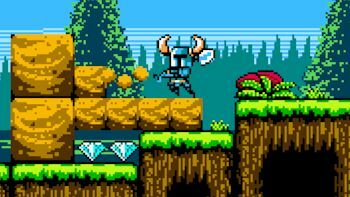 Shovel Knight is challenging, bringing tricky bosses and unforgiving traps to bear. Shovel Knight can be a heck of a lot of fun. Shovel Knight is also full of stuff that I never want to play again. I realize that some people will be angry at me and suggest I'm saying this game is "too hard." I remember how many critics were held up as a sign of the "pussification" of modern gamers for complaining about Duck Tales Remastered. My problem with this game is not that it's hard, though - it's the way in which the difficulty is commonly achieved. When it feels genuinely challenging, Shovel Knight can be an immensely satisfying experience. Finally nailing a boss that has been nothing but trouble, working out its varied moveset and exploiting its weakness, is an elating prospect. Getting through a devilishly laid out level full of traps and sneakily guarded enemies can be immensely rewarding. Unfortunately, the rest of the game relies on what some may commonly refer to as Medusa Heading for its sense of challenge. Any Castlevania fan will remember the Medusa Heads and shudder with a deep seated trauma that spans decades. If you're unaware, the classic action platformer was notorious for player characters that would get knocked backwards a significant distance after taking a hit. In a game full of instant-death chasms, that was bad enough already, but then opponents like the Medusa Head would appear, flying across the screen in such perfect time as to coincide with some of the trickier jumps, hoping the player would leap into them inadvertently, take damage, and fall backwards helplessly into a gaping hole. Shovel Knight is a game that says "Hey, Medusa Heads were fun, let's do that lots and lots and lots!" This is not to say Yacht Club Games made a bad or unenjoyable title. It's just awe-inspiringly frustrating, to the point where there are some levels I simply never want to play again as long as I live. Like a true-blooded Belmont, the titular Shovel Knight's reaction to pain is to leap backwards, and do so in a world crammed with death drops and fatal spikes, all eager to collaborate with the ambushing opponents. Hell, even hitting an enemy shoves the Knight back a little ways, increasing the opportunity for gravity-flavored failure. They definitely nailed that sense of utter relief in reaching a checkpoint, but that relief often comes tinged with a thought of, "Thank God I don't have to go through THAT again," which is not exactly the right kind of attitude to evoke. That disclaimer aside, however, Shovel Knight is an extremely well made game, one that shows genuine reverence for the classic platformers of lore in a world where dozens of "retro 8-bit platform rage games" pay little more than cynical lip service. Any two-bit developer can mash some pixels together and call it an homage - Yacht Club Games is steeped in references and stylistic nods, showcasing a knowledge and respect for gaming history that goes some way toward justifying how exasperating it can be.